It took around a hundred years between Albert Einstein crafting his theory of general relativity and the confirmation of one of its wildest predictions, gravitational waves. So naturally, folks have been especially skeptical about funding expensive projects to look harder for them. But now that experiments are actually finding gravitational waves, scientists are ready to take the next step: Space. The European Space Agency announced yesterday that they’d approved the Laser Interferometer Space Antennae (LISA), a space-based gravitational wave observatory. And that’s important. If and when the satellites launch in 2034, they’ll open up a whole new realm of astronomy, allowing us to study the most violent collisions in the universe: supermassive black holes coalescing from merging galaxies. LISA seeks to explore an entirely different kind of gravitational wave, ripples that change the shape of space itself, than its Earth-based counter parts, LIGO. Three spacecraft will orbit in a triangle behind Earth, each separated by 2.5 million kilometers (around 1.5 million miles). Aside from the enormous distances involved, the function of LISA and the LIGO experiments is essentially the same. Each ship contains a pair of cubes which serve as reference points, and lasers between them. LISA detects gravitational waves by comparing the distance the lasers travel, and compares the lasers to see a gravitational wave’s properties. Longer distances allow the system to measure longer wavelength gravitational waves, ones that take much longer to get from peak to peak. There are lots of reasons to look for gravitational waves in space as well as on Earth, explained Bartos. LISA overcomes two major problems faced by earthbound LIGO: Space is already creating a vacuum, so LISA doesn’t need to spend lots of money creating a vacuum chamber to reduce background noise like LIGO did (around 17 percent of their budget, said Bartos). Plus, movements on or in the Earth can’t muddle its signal. Independent analyses are already causing some folks worry about the potential for noise to create an erroneous signal, Sabine Hossenfelder writes for Forbes. But probably most importantly, LISA will hunt for a whole different class of gravitational waves. As of now, LIGO only looks for gravitational waves produced by colliding stellar mass black holes—those on the order of tens of times the mass of our own Sun. Supermassive black holes at galactic centers are more like billions of times the Sun’s mass, so their waves are much, much longer, far too long for LIGO’s four-kilometer arms to detect. A 2.5 million kilometer arm opens up an entirely different realm, like the difference between using binoculars and a space-based telescope. Finally, LISA can potentially spot things like waves created by smaller black holes before they’ve collided, more distant events, or pretty much anything that might create a longer wavelength gravitational wave. The announcement isn’t coming from nowhere, though. 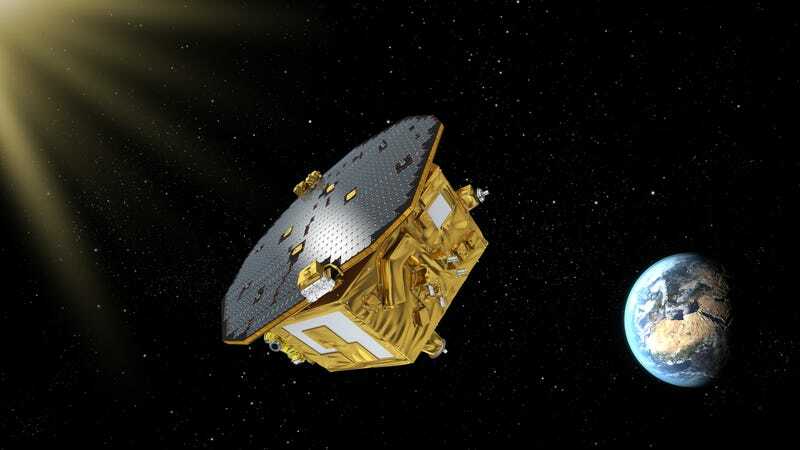 Yesterday, the European Space Agency concluded its LISA Pathfinder mission, which consisted of a single LISA prototype that tested the concept and potential for noise. That mission was a success, they report in a press release. All of this is taking a long time because scientists have been skeptical about gravitational waves prior to the February, 2016 announcement, explained Bartos. Physicist Joe Weber claimed to see gravitational waves back in 1969, but others couldn’t recreate his results, increasing folks’ skepticism. NASA decided not to prioritize LISA back in 2011, and pulled out of the mission. But now that LIGO has confirmed gravitational waves’ existence, it appears that NASA wants to rejoin. There are other proposed ways to spot gravitational waves as well, by the way, by using pulsars, neutron stars rotating so regularly that they essentially tick like cosmic clocks. But at least we know that people will be actively working on making LISA a reality.